Graves park is Sheffield's biggest park located int he south west of the city. The park boasts lots of facilties for visitors including a cafe, 2 children's paygrounds, animal farm, sporting facilities: Bowling Greens*, Cricket*, Football*, Tennis, 9 Hole Pitch & Putt* nature trails, fishing lake, woodland and plenty of open space. * some of these facilties will be chargeable. Graves Park Animal Farm provides a popular home to some of the rarest breeds of farm animals in the country. You can get up close and personal with Tamworth pigs; Highland cattle and Jacob sheep, plus goats, donkeys,waterfowl and many more. 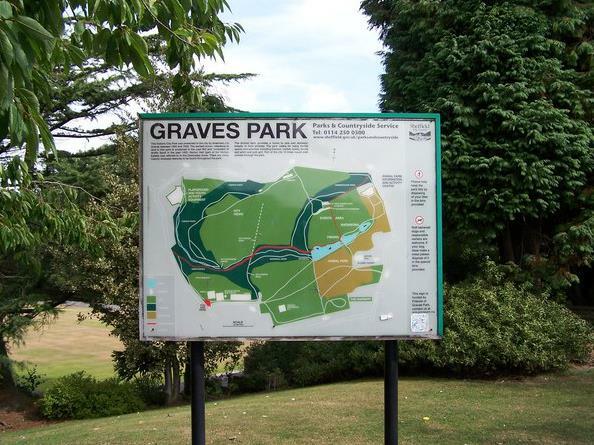 Graves Park is easy to find by car from both Sheffield City Centre and Chesterfield. The park has two car parking areas the main one being located at the Buntings Nook entrance. This page provides directions to this car park. Follow the A61 towards Chesterfield, at the traffic lights just after Homebase (which you will pass on the left) turn left onto Scarsdale Road. Follow Scarsdale Road into Derbyshire Lane and continue for about three quarters of a mile. The park will now be on your right, continue along Hemsworth Road until you reach some traffic lights the entrance to the park is on the right just before Bunting Nook. Accessible by Public Transport: Sheffield station is 3 miles away.